While painting furniture around the house has not put any money in my pocket, it has kept money there. Instead of buying a new piece or sometimes not buying at all, new or used, your money will be used for something else. I love the color. I kind of used it for practice, after not painting for so long. My niece loved it! I stopped painting for a while, life gets in the way, you downsize and have no room to store things. After quitting my job over a year ago, I started to paint again, thinking that I could paint and sell my pieces locally through ad sites. 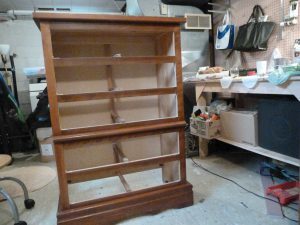 Painting furniture is also a great way to de-clutter your basement/garage. Paint a piece you no longer use or need and give it to a friend or a family member. 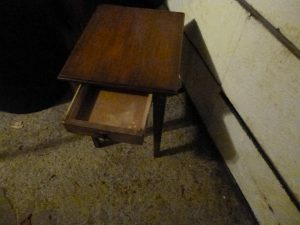 My sister gave me this table to paint for her daughter, it sat in my basement for years, I moved twice with it in tow because I got it just before I stopped painting, it just sat in the basement and then two garages after that. I looked at it the other day and out of guilt and the need to de-clutter I went to Home Depot purchased some supplies and some Ralph Lauren furniture paint and went to work. After getting rid of the family of spiders living in it, I went about prepping it for painting. Some pieces will need more prep work than others, the amount and kind of prepping depends on the condition of the piece and the second part of prepping are to prime or not to prime. I used a primer although I was using a paint with primer. My sister and niece were both happy with it, so I moved into my son’s room and decided to change the look of the chest of drawers because I was about to paint his room. 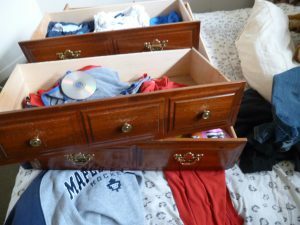 With the chest of drawers from my son’s room, this is what I did. 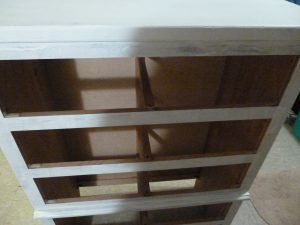 filled some of the holes in the drawer with wood filler (sand after drying). Some of the drawers had 3 knobs or handle with 2 holes and I was planning on using 2 knobs per drawer. This is what I started with. I liked the Ralph Lauren Paint, it was easy to work with and I also love their color palette. I know so many refurbish painter of furniture have been using Chalk Paint, I have never used chalk paint. I wasn’t really interested, don’t know why, but then I discovered Fusion paint and it’s all I’ll be using going forward. It’s like butter to work with, it glides on and gives amazing coverage and you end up with a beautiful smooth finish. Depending on where/what the piece is been used you do not need a top coat, I have no complaints with this product. I have been to two fusion paint workshop to test out different techniques and just loved using this paint. I have a number of pieces that I purchased at the thrift store and a few more pieces around the house that I want to paint and I’ll share those as I go. 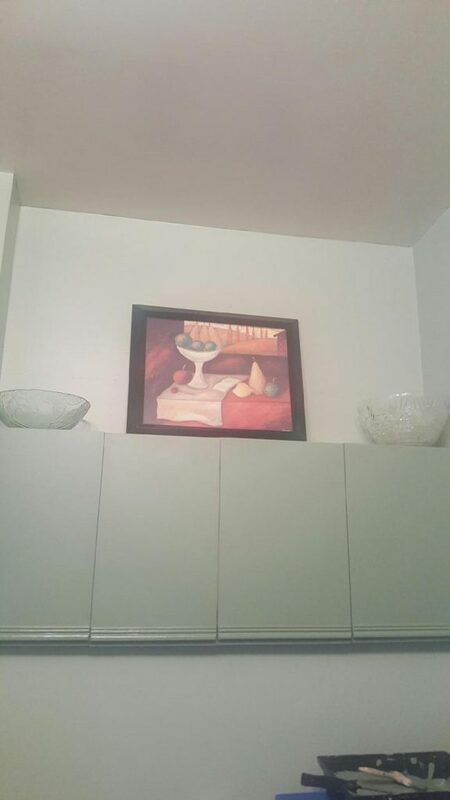 I volunteered to paint my sister’s kitchen, the walls, and cupboards for her, she is not very handy and the thought of painting sends her into a panic attack. She warned me that she would not be helping at all, which was fine with me. Got to her place on a Friday morning and committed to 48 hours, that turned into 72 hours. She has 10 feet high ceiling and I’m afraid of climbing on ladders. I don’t know how I didn’t remember that. To top that all off, she had 3 different paint colors from Sherman Williams(never used brand before), none of which she wanted to paint her kitchen with, so I had to make two different colors of what she had. She had 2 different shades of green (my favorite color), a black green, a spinach green and a putty grey. I came up with 2 different shades of green, I put the lighter one on the walls. I used the same combination and then gradually added the darker green until I get a shade I was happy with and be sure to have enough of it to paint with. They complimented each other well, she was surprised at the result of that. 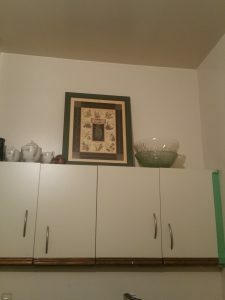 I also had to fill all the holes in the cupboards because we chose to go with no hardware and painted the baseboards and the 6 ft window frame in white. I then gave the cupboard doors a light sanding (no distress) added a dark wax to give them some depth. She loves it. 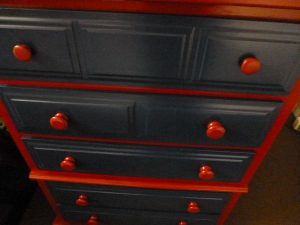 Instant transformation is what you get when you paint a piece of furniture. 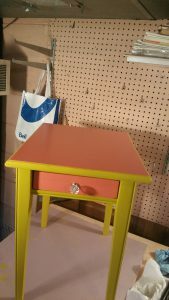 Remember the Ralph Lauren paint, I used on the table for my niece and the chest for my son’s room. I am experimenting again, I took the Blue from my son’s room mixed it with the Yellow tone from my the table for my niece and came up with the green ( more green). I have these 2 tables that have a dark finish on them, they were not in terrible condition but the tops were showing signs of wear and tear. Fusion Mineral paint is 100% acrylic water based paint. The mineral in Fusion paint refers to the pigment used which are naturally harvested from the earth, this gives its color depth much better than synthetic pigments. It also makes it more durable to UV light and time. On site will be all the cupboards surroundings, moldings, and trim. I will post my progress when I start the project. You can always leave a comment or ask a question, both are welcomed. I’m an affiliate marketer there are links on my site that I may receive a commission from if clicked. My reviews are my own honest opinion about products and services used. © 2019 Ways To Make Money Online. All rights reserved.